Artist Tom Van Sant used a series of 2′ x 2′ mirrors spread across the Mojave Desert to create a 1.5-mile-wide eye on a Landsat 3 image acquired on June 11, 1980. Sep 4, 2014 • In 1980, artist Tom Van Sant created the world’s largest manmade image with the help of Landsat 3. Van Sant’s team sets up a 2′ x 2′ reflecting mirror in the Mojave Desert. 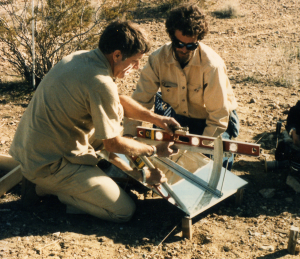 Van Sant ‘s creation, commissioned by the Los Angeles Bicentennial Commission, used a series of precisely placed mirrors in the Mojave Desert north of Los Angeles to reflect sunlight into Landsat 3’s detectors as it passed overhead on June 11, 1980. The mirrors—each only 2’ x 2’—saturated a number of Landsat 3’s pixels. The result was an outline of a massive white eye on the Landsat image just south of Silver Peak in the Mojave’s Shadow Mountains. 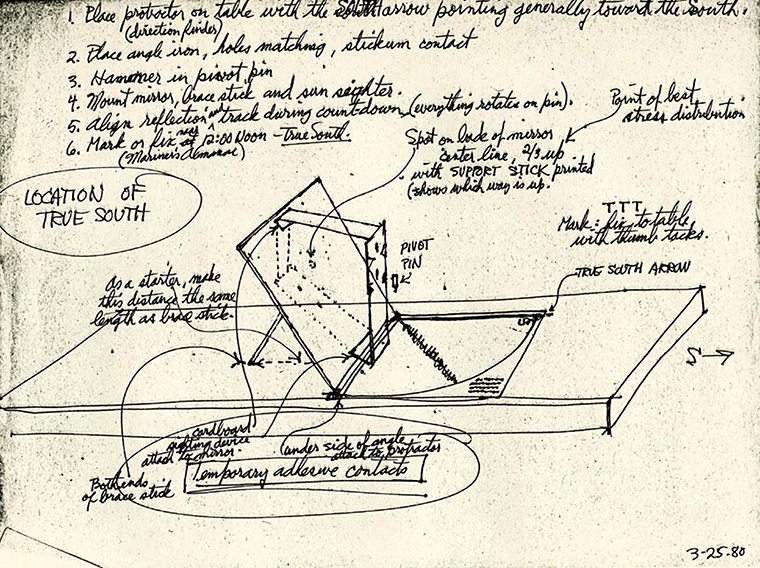 Van Sant worked closely with Alden Colvocoresses from USGS and William Evans from Sanford Research Institute to calculate the exact angle settings for each mirror. Each mirror’s position had to be accurate to 1/10th of a degree and account for Earth’s rotation, the speed of Landsat 3, and the position of the sun. Van Sant considered this artwork to be “a large symbolic eye gazing skyward.” The 1.5-mile-wide eye (2.5 km) was 100,000 times larger than a human eye. In a corresponding art project, Van Sant drew an eye on a salt crystal that was 100,000 times smaller than a human eye at ¼ micron across, with a pupil size of only 100 atoms.